Buckle up and brace yourself for an intergalactic adventure. Made of recycled timber this is a gorgeous addition to any nursery or child’s bedroom and it’s as practical as it is gorgeous. 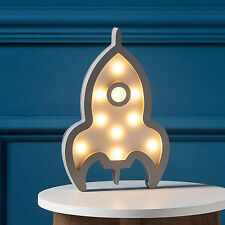 Rocket Wall Light. SUMMER INFANT SLUMBER BUDDIES EDDIE THE ELEPHANT NIGHT LIGHT BABY / TODDLER. Eddie the Elephant includes a multi-colour star and moon display that projects around the room, with the choice of 5 different sounds (from lullabies to nature) that will help to give a child or toddler the perfect night’s rest. The Slumber Buddy is light weight, helping to make it a portable and accessible sleeping aid that can be used in all different environments, such as overnight stays and holidays. This therefore creates a comforting and familiar bed time routine for the child, whether in their own cot, or away from home. Uses 3 x AAA batteries Condition is Used. Dispatched with Royal Mail 2nd Class. The light will also look equally good in a man cave or on a desk or shelf. 3D light shaped like Bumblebee's head. Sends out a soft, warm glow. Lights up and changes colour automatically. Kids Bedroom. Switch it on and the Death Star will fade and phase through a spectrum of comforting colours! 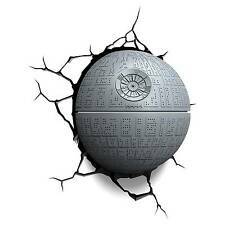 The Death Star Illumi-Mate lamp is a detailed rendering of the Empire’s technological terror, made from durable plastic. From the makers of the award winning Grobag, Gro Clock, Gro Egg and more - The Gro–light fits easily to your normal overhead light or bedside lamp and fills your baby’s room with a soft glow when you flick the light switch once. Heartbeat and breathing sounds plus heartbeat vibrations. Heartbeat and breathing sounds. 3 modes of comfort - heartbeat and breathing, vibrations, both. Heartbeat vibrations only. The soft pulsing vibrations mimic parent’s heartbeat. Think Geek Minecraft Redstone Ore night light. Tap to turn light off. 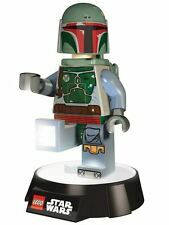 Star Wars Mini Light is an 11.5 cm (approx 4.5 in) cylindrical light base on the popular Star Wars character. Easy to operate by pressing the light down for on and off, the light also makes official character sounds when turned on. Baby Sleep Aid Bedroom Sensor Light Sound Soother Comforter Soft Plush Toy Owl. noise sensor and glowing light. colour: grey, orange, ivory. toy and light. soft touch easy to clean. Suitable from age 0 . The baby owl night light is a battery operated LED light and shut down automatically after approx 60 minutes to save energy. The used warm glow LED is complete childsafe. Our perky owls will watch of your little ones when falling asleep. Designed with safety in mind, the light is cordless, battery operated and stays cool to touch. Cool 3D effect wall light shaped like Darth Vader. Uses energy efficient LED bulbs which will never require changing. Colour changing light in the shape of Star Wars Millennium Falcon. Kids Character OFFICIAL Gifts. LED light: Stays cool to the touch. We aim to keep this process as “stress free” and as simple as possible. The light will also look equally good in a man cave or on a desk or shelf. 3D light shaped like Bumblebee's head. Sends out a soft, warm glow. Lights up and changes colour automatically. Fully portable. 3D Light FX Star Wars Death Star 3D Deco Light. Star Wars Death Star ™3D Deco Light from 3D Light FX. A great addition to a child's room, would also make a fantastic novelty gift for adult Star Wars fans. ROCKET & GROOT, AT THERE BEST, NIGHT LIGHT. MyBaby Creature Comfort Elephant Night Light Features Portable & bedside nightlight. Bedside or Portable. Gently press the Elephant trunk to cycle through light options. A comforting glow. Sleep Therapy. Colour Grey Elephant. 4 colour LED display options - blue, red, green, and all colours (light show). 15, 30 and 45 minute auto shut off feature. Material 100% Polyester fabric. Calming star and moon display. The Pabobo Mimi Bunny Musical Stars Projector is an adorable combination of a soft, plush bunny and musical stars projector. The projector creates a beautiful starry sky on the bedroom ceiling that will soothe baby. A calming starry sky display and a peaceful selection of sounds help relax and soothe baby to sleep. We are here to help! 4 colour LED display options - blue, red, green, and all colours (light show). Colour changing light in the shape of Star Wars Millennium Falcon. Great as a comfort light -ideal for camping, sleep overs or trips away. Hand sized and portable. LED light: Stays cool to the touch. Batteries included. Replacement batteries: 3 X LR44/1.5V . 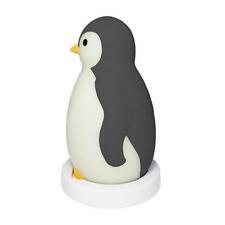 HURN & HURN DISCOVERIES ZOE THE PENGUIN MUSIC BOX BABY NIGHT LIGHT. Penguin shaped sound machine / night light. Purple dial on front of penguin with 10 buttons. Could be replaced or used as standing night light and music player. For sale is a Sweet Dreams Ewan the Dream Sheep. This Ewan is grey. Condition is New. 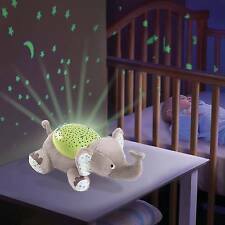 MyBaby, Comfort Creatures Elephant Help your baby achieve sweet dreams with their Comfort Creature night light! This elephant night light provides the whimsical appeal of your child's favourite animal with the comfort of a soft coloured glow. This children's night light gives a very soft and veiled light and will help the little ones to fall asleep without fuss. Even when not turned on, the toadstool makes a delightful decorative addition to any childs bedroom. This elephant friend is a natural fit for the modern nursery. An adjustable pivot lens projects a starry nightscape onto any surface so your little one can see the luminous sky from their favourite sleeping position. The Pabobo lumiblo is magical?. it turns on and off with a simple blow! When you locate the star blow sensor towards the base of the lumiblo, the fun really starts! Little ones benefit from the soft light the lantern emits as well as the convenience of picking the lantern up should they want to move safely in the dark. The Pabobo Musical Turtle Stars Projector is a fun, portable turtle that creates a beautiful starry sky on the bedroom ceiling and plays a gentle lullaby to soothe baby. The night sky will light up through green, blue and orange as the colours softly fade from one to the other. The Pabobo Lumiblo is magical… it turns on and off with a simple blow! When you locate the star blow sensor towards the base of the Lumiblo, the fun really starts! Little ones benefit from the soft light the lantern emits as well as the convenience of picking the lantern up should they want to move safely in the dark. star wars millennium falcon bed side light. Condition is New. Box slightly worn change colours automatically Dispatched with Royal Mail 2nd Class. However, it should be kept out of the reach of small children.SWEET DREAMS. 1x Navaris LED night light "Alpaca". The battery operated nightstand lamp with 15 min. A guiding light for all ages with the Navaris LED night light. This is to safeguard the best interest of both parties. At night, auto turn on when detecting people coming, auto turn off when people left. Type: Sensor Led light. Product Color: Grey. Led Light Color: White. Lamp type: table lamp. Shade: 100% polyester. Material: Plastic grey. A high-performance up to 40 watt bulb with an E14 socket can that light be used to illuminate optimally your selected area. Kitchen appliances. Luminaire type: wall-ceiling lamp Motive: Penguin Material: steel Color: white, blue, red, gray Lampshade: glass, satined . Material: nickel matt, plastic Lampshade: textile grey Cable switch Diameter x height in cm: 26 x 50 Height of lampshade in cm: 20 . Her special trick: On the front is a little star. One blow, however, turns the light on itself as if by magic - and also off! Even the little ones can do it! The Nightlight lights gently for an hour and goes from alone from.